What Day Of The Week Was January 16, 2006? 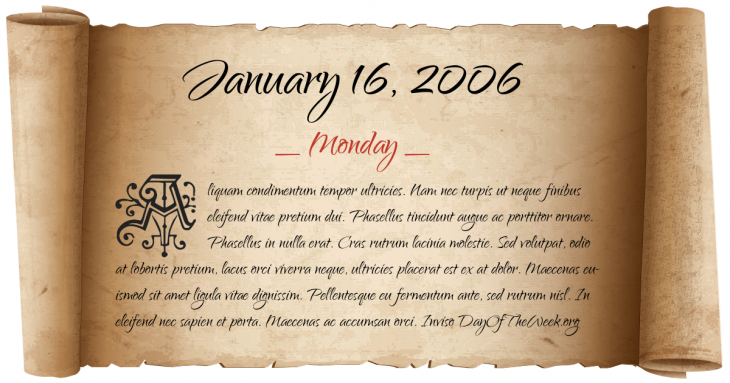 January 16, 2006 was the 16th day of the year 2006 in the Gregorian calendar. There were 349 days remaining until the end of the year. The day of the week was Monday. A person born on this day will be 13 years old today. If that same person saved a Half dollar every day starting at age 7, then by now that person has accumulated $1,145.50 today. Here’s the January 2006 calendar. You can also browse the full year monthly 2006 calendar. Ellen Johnson Sirleaf is sworn in as Liberia’s new president. She becomes Africa’s first female elected head of state.